In most cases where I need to compare two folders recursively on a Windows system I use my go-to tool Beyond Compare. It is an excellent utility, and one that I think should be among the first utilities any developer should install on a new machine. However, today I was doing a reconciliation as part of a very large file migration project that required comparing two folders that each contained hundreds of millions of files spread across thousands of sub-folders. BC was having a lot of trouble and choked on many of my comparisons. It just wasn’t the tool for today’s job. I needed another solution. Necessity mothered some invention and I found an inventive way to use a combination of command switches on RoboCopy to perform the comparison. If you are not familiar with RoboCopy, and you do a lot of mass copying of files, you need to stop what you are doing and learn about it pronto. It is a supercharged version of XCopy that has been included with Windows since Vista. It has a ton of great features such as multi-threaded file copying, selectively copying changed files, and resumable copies that make it a must especially for big file copy jobs over flaky network connections. So here’s the command to perform a basic comparison of two folders and write a log file listing the differences. The /NDL option is a handy way to suppress the inclusion of every folder checked (regardless of whether it contains differences) in the log, but there because of the way it works it is not a good idea in all circumstances. Consider the following before you use /NDL. Folders that exist only on source or destination are not logged unless at least one mismatched file is present or a source file is missing on destination. Folders that exist only on the destination are not logged at all regardless of contents. If you omit the /NDL option, it is necessary to include the /FP option if you want full paths listed for each file. One of the first things you learn to do incorrectly as a programmer is commenting your code. My experience with student and recently graduated programmers tells me that college is a really good place to learn really bad code commenting techniques. This is just one of those areas where in-theory and in-practice don’t align well. There are two factors working against you learning good commenting technique in college. Unlike the real world, you do a lot of small one-off projects as a solo developer. There’s no one out there fantasizing about dropping a boulder on you for making them decipher your coding atrocity. That commenting style you are emulating from your textbook is only a good practice when the comments are intended for a student learning to program. It is downright annoying to professional programmers. These tips are primarily intended for upstart programmers who are transitioning into the real world of programming, and hopefully will prevent a few from looking quite so n00bish during their first code review. Code Review? Oh yeah, that’s something else they didn’t teach you in school, but that’s a whole other article, I’ll defer to Jason Cohen on that one. It’s easy to project your own worldview that code is a foreign language understood only by computers, and that you are doing the reader a service by explaining what each line does in some form of human language. Or perhaps you are doing it for the benefit of that non-programmer manager who will certainly want to read your code (Spoiler: He won’t). You may have been taught to program by first writing pseudo-code comments then writing the real code into that wire-frame. This is a perfectly reasonable approach for a novice programmer. Just be sure to replace the comments with the code, and don’t leave them in there. Computer: Enemy is matching velocity. Gwen DeMarco: The enemy is matching velocity! Sir Alexander Dane: We heard it the first time! Gwen DeMarco: Gosh, I’m doing it. I’m repeating the darn computer! Code examples used to teach a concept or new programming language. This is a bad habit propagated by code samples in programing books and open source copyright notices that are desperate to make you pay attention to them. Why, that’s silly. You’d never do something so silly in your comments. ORLY? Does this look familiar? Programmers love to go “touch up” their code to make it look good when their brain hurts and they want something easy to do for a while. It may be a waste of time, but at least they are wasting it during periods where they wouldn’t be productive anyway. The trouble is that it creates a time-wasting maintenance tax imposed on anyone working with the code in the future just to keep the pretty little box intact when the text ruins the symmetry of it. Even programmers who hate these header blocks tend to take the time to maintain them because they like consistency and every other method in the project has one. How much is it bugging you that the right border on that block is misaligned? Yeah. That’s the point. (3) Header Blocks: Nuisance or Menace? This one is going to be controversial, but I’m holding my ground. I don’t like blocks of header comments at the top of every file, method or class. Not in a boat, not with a goat. They are enablers for badly named objects/methods – Of course, header blocks aren’t the cause for badly named identifiers, but they are an easy excuse to not put in the work to come up with meaningful names, an often deceptively difficult task. It provides too much slack to just assume the consumer can just read the “inline documentation” to solve the mystery of what the DoTheMonkeyThing method is all about. The consumer of thy code should never have to see its source code to use it, not even the comments. They never get updated: We all know that methods are supposed to remain short and sweet, but real life gets in the way and before you know it you have a 4K line class and the header block is scrolled off of the screen in the IDE 83% of the time. Out of sight, out of mind, never updated. The bad news is that they are usually out of date. The good news is that people rarely read them so the opportunity for confusion is mitigated somewhat. Either way, why waste your time on something that is more likely to hurt than help? Bad Documentation is worse than no documentation. Exception: Some languages (Java/C#) have tools that can digest specially formatted header block comments into documentation or Intellisense/Autocomplete hints. Still, remember rule (2) and stick to the minimum required by the tool and draw the line at creating any form of ASCII art. This issue is so common that I have to assume that programmers (a) don’t know how to use source control; or (b) don’t trust it. The programmers involved in the evolution of this method probably checked this code into a source control system designed to track the change history of every file, but decided to clutter up the code anyway. These same programmers more than likely always leave the Check-In Comments box empty on their commits. I think I hate this type of comment worst of all, because it imposes a duty on other programmers to keep up the tradition of duplicating effort and wasting time maintaining this chaff. I almost always delete this mess from any code I touch without an ounce of guilt. I encourage you to do the same. // code removed, smoothie shop closed. // leaving it in case a new one opens. Another feature of any tool that has any right to call itself a SCM is the ability to recover old versions of code, including the parts you removed. If you want to be triple super extra sure, create a branch to help you with your trust issues. Comments are little signposts in your code explaining it to future archaeologists that desperately need to understand how 21st century man sorted lists of purchase orders. Unfortunately, as Donald Norman explained so brilliantly in The Design of Everyday Things, things generally need signs because their affordances have failed. In plain English, when you add a comment you are admitting that you have written code that doesn’t communicate its purpose well. Sign:”This is a mop sink.” Why would that be necces… oh. Despite what your prof told you in college, a high comment to code ratio is not a good thing. I’m not saying to avoid them completely, but if you have a 1-1 or even a 5-1 ratio of LOC to comments, you are probably overdoing it. The need for excessive comments is a good indicator that your code needs refactoring. Talk with your code, not your comments. double length = h * 1.845; //magic numbers are EVIL! // 5-6 steps to flip bit.
} // ... while monkey do.
} // ... if monkey see. Several of the ideas presented here, and a good deal of the fundamental things I know about programming as part of a team, I learned from the book Code Complete by Steve McConnell. If you are a working programmer and have not read this book yet, stop what you are doing and read it before you write another line of code. Do you ever wish you could use the SQL IN operator in your C# code to make your conditional blocks more concise and your code easier to read? Perhaps it’s just my persnickety nature, but I believe that line-wrapped conditional expressions like this are a code smell. With a simple extension class you can upgrade your string classes to do this very thing. Step 1: Create an extension class as demonstrated here. Step 2: Add a reference to the extension namespace and use it. Dim foodItem As String = "Bacon"
This week I got a request troubleshoot a legacy Microsoft Access application that has been floating around our company for ages, but still gets used daily because dang it, it does the job and always has. Seems like most companies that are standardized on MS Office have a few of these lurking out on the network. Earlier in my career I did a ton of work in MS Access and have garnered a reputation within my company for being an expert in this oft maligned platform so I got the call to look into the problem. It had been quite a while since I’d done any real work on MS Access and I’d forgotten about how quirky it could be. Also, I am more than a little disappointed at how Microsoft has mangled the UI of my old friend Access in the 2007 version. It is almost painful to work with it as a power-user in the current incarnation. So anyway, the issue turned out to be that someone increased the length of a field in the underlying SQL Server table linked into the Access application. They increased it past the magical border (255 characters) between what Access considers a text and a memo field, which imposed new limits on how it could be used. 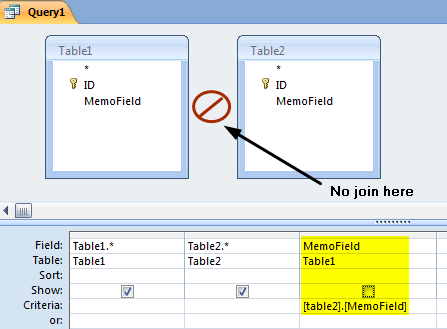 In particular, Access doesn’t allow either end of a join in a query to be a memo field. The solution is painfully simple. So much so that I have to wonder why Access doesn’t just do it behind the scenes. Perhaps it is just trying to discourage you from building databases that link on big text fields for your own good (see “The Caveat” below). Access will raise nary a complaint if you run this query which is logically equivalent to the one it abhorred. That’s all there is to it. A final note. It is a definite database smell for an application to be joining tables on long text fields and will likely be the source of some performance issues in a database of non-trivial size. However, as was the case for the application I was tweaking, joining on long text fields is sometimes necessary in queries used for data clean-up, validation, or replication. Still, use this type of join with caution avoiding it whenever possible. One of the minor aggravations in my life, right behind lyricists who want to “hold me tight” despite all the homeless adverbs in the world, is time required to get my Windows development machine from a cold brick to a state where I can do productive work. This is exacerbated by the fact that I, as a developer, tend to re-start my machine more often than a typical computer user. Also, I’ve got A number of heavyweight services than run on my development machine including web and database servers so I can work on my projects when disconnected from the mothership. I’ve been doing my best to set the services that I use sparsely to manual and then start them only when I am ready to use them to minimize boot time. But today I found another option. While I was in services manager starting up a local SQL instance I noticed an unfamiliar value in the Startup Type column: Automatic (Delayed Start). Delayed Start? What's that all about? After some quick research, I discovered that this new startup option was introduced in Vista to expedite the boot sequence by de-prioritizing services that need to be launched at startup, but for which there is no hurry to get them spun up. The gist of it is this: Services with this setting will be launched at the end of the start-up process and the initial thread is given a priority of THREAD_PRIORITY_LOWEST to avoid sacrificing UI responsiveness during the start-up sequence just to get things like “Google Updater” running immediately. Local development instances of Database or Web Servers. Updaters: Windows Update, Google, Windows Search, Any type of indexer. Any of the crapware from Apple or Adobe that they insist are so important they must run at all times. Maybe I’m late to the party discovering this feature, but like many companies mine completely ignored Vista and are just now getting around to Windows 7 and in the process discovering a lot of nice “new” features that may have technically been around a while. I’m not proud. I’m willing to admit my extended ignorance of this feature if it can benefit another developer out there. Did you guys know about this? Anyone know of other nice goodies in Windows 7/Vista that are especially handy for tweaking development machines? Here are a few shortcuts to simplify working with assemblies (either COM or .NET) that I have found especially useful over my years as a developer. If you are still working with COM style objects regularly, associating the DLL and/or OCX extensions with RegSvr32.exe (in the Windows\system32 directory) allows you to register or re-register them quickly by double-clicking the file in explorer. Step 1: Right-Click a DLL file and choose the "Open With..." command. So now you can register components easily, what about un-registering them? That’s a snap too. Over the past few days I have been doing a higher than usual amount of work using the Windows console interface. I’ve been at this computing thing for quite some time, easily long enough to be old friends with the venerable DOS style command line, but not so much that I have yet figured out its cryptic emerald emoticon C:\>. Today, my task involved a considerable amount of copying and pasting to and from the command line. As I am sure you are also painfully aware, the keyboard shortcut Ctrl-v (paste) don’t work at the command line unless your are looking for a shorthand way to enter the 2 character combination “^V” with only the press of two keys. For the first 20 times or so, I simply resorted to my standard approach for cut/paste operations. That is, using the menu from the application icon in the top left corner of the console window as shown here. This approach is incredibly slow, but I don’t usually do very many clipboard operations at a command line, so I have always just sucked it up and lived with it. Today, however, it was getting extremely tedious and frustrating. Fed up, I quested a way to use shortcut keys in the console interface for accessing the clipboard. I am sorry to report that I didn’t find it, but did find something almost as good. Mousing the C prompt? Who Knew? I don’t know how I didn’t discover this sooner, but you can right-click anywhere on the console window and get a shortcut menu. I suppose the concept of using a mouse at a command line just didn’t occur to me. In any event, using this technique is definitely quicker that my old method because it requires less menu navigation to get to the useful commands. The copy/cut commands are still a little nonstandard and clumsy given that you must go into “mark” mode before you select the text. Also, marking multiline information is a bit quirky. After an unsuccessful find, it emits an extremely loud beep from the built in computer speaker. 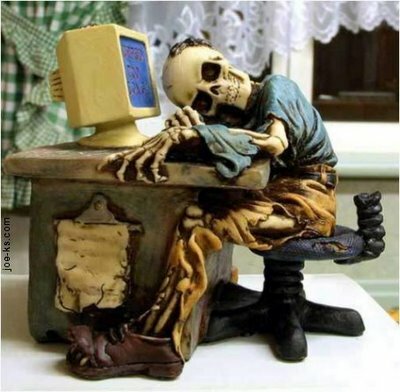 After a successful find it turns on “Mark” mode to prepare for a copy. Most are familiar with using the up/down arrow keys to scroll through previous commands, but how many of you knew you could get a menu of recently used commands by pressing F7? You can reset this history by hitting Alt-F7. F1: Paste the previous command one character at a time. F2 (then enter a character):Pastes the previous last command up to, but not including, the first occurance of the provided character. F3: Pastes the previous command in its entirety. Note:You can’t use a wildcard as the first character with CD for some reason. Am I the only one who didn’t know about this? I started to wonder if I was just dense and had missed this feature that everyone in the world knew about except me. I did a quick poll of my peers and discovered that about half of them knew about it, and the other half didn’t know about using my old technique. Out of curiosity, I’d like to see what my readers knew before reading this article. Do you have any cool command-line tricks to add? Put them in the comments and I’ll add the good ones to this post.